Precision Shunts - 0.1 to 10 Amp | Ohm-Labs, Inc. The CS series precision current shunts are designed for the most demanding measurement applications. 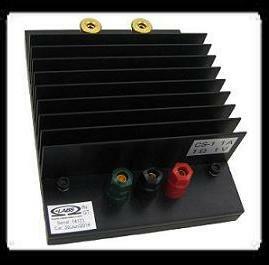 These shunts provide excellent long term stability and very low temperature and power coefficients. Designed for laboratory use, they are rugged enough to be installed in environments subject to wide variations in temperature and to vibration or shock. Every shunt is provided with accredited calibration through full rated current. The CS-0.1 to CS-10 shunts exhibit close AC conformance to DC values. AC/DC difference is estimated to be less than 0.01 % to 1 kHz. The temperature coefficient of resistance is less than 5 ppm / °C, which minimizes the change in resistance due to self heating under power. Connection errors, common in many shunts, are minmized by the internal bus structure.Connections are via gold plated binding posts, which accept bare wire, banana plugs and spades. Standard models are listed, but other Amp/Volt combinations are available.